Microsoft HTML Help(also known as CHM help) is the standard help system for a software application in Windows platform. But when you only have a Microsoft Word Document for you application, how to convert it to a chm file? Our DOC2CHM is easy solution. With DOC2CHM, you can easy convert Microsoft Word Document to CHM file by original layout. You can convert doc to chm by doc outline, page range or continuous html page. A powerful tool that convert word to chm, doc to chm in Windows platform. * Convert DOC to CHM by Original Layout - With DOC2CHM you can convert doc to chm by doc outline, page range or continuous html page. 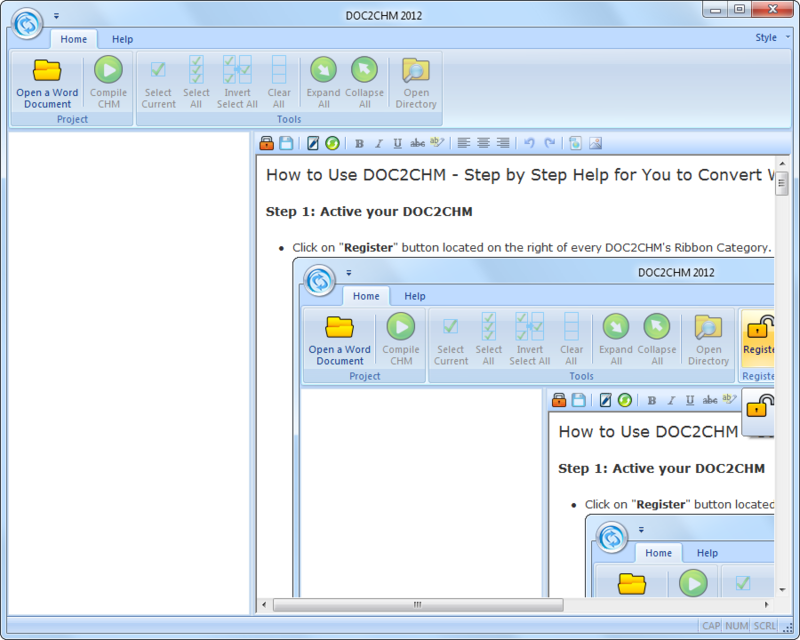 * Wizard-style User Interface - DOC2CHM has a friendly and self explaining step-by-step user's interface. This allows you to convert doc to chm after you have downloaded it from our website, and saves your time without reading huge help files: all possible actions are described in detail on each Wizard's page. * Custom CHM Windows Definitions - Control your result chm file style in your hand by customing CHM Windows Definitions, such as Content Tree Style, Navigation Panel and so on. * Support Microsoft Word 2000 or Higher - DOC2CHM supports Microsoft Word 2000 or higher. Microsoft Word 2007 with .docx file is also supported. Qweas is providing links to DOC2CHM 2012 5.0.0706 as a courtesy, and makes no representations regarding DOC2CHM or any other applications or any information related thereto. Any questions, complaints or claims regarding this application DOC2CHM 2012 5.0.0706 must be directed to the appropriate software vendor. You may click the publisher link of DOC2CHM on the top of this page to get more details about the vendor.